The first day of spring is just two weeks away, but the temperature outside is hovering in the teens here in the Chicagoland area. Living in the Midwest requires us to battle the “winter blues” for a much longer period. The increased exposure to cold temperatures and less sunlight can contribute to winter stress, signaling our bodies to slow down and conserve energy. Strains on our health also tend to increase in colder weather. Fortunately, there are ways to heal winter-themed stress. Let’s look at some remedies for beating the winter blues. Having regular routines in place provides a foundation for success, and your hot tub can help. During the cold, dark winter months, you can ease the difficulty of waking up and getting out of bed each morning with the expectation of a warm soak in a hot tub. You’ll soon notice that lethargy transforms into motivation. Caldera Spas come with the latest energy-efficient technology and insulation, so your hot tub is always be ready for you, set to your ideal temperature. At any time of the day, soaking in your hot tub is both relaxing and empowering. It helps ease the transition from your work life to your home life. It can calm you each evening before bedtime to help you get a good night’s sleep. Hot Tubs can even be an important part of a daily ritual you share with your partner or your family to expand your quality time together. Winter stress can cause stiffness and muscle tension. You can relieve your physical aches and pains by regular hydrotherapy in the hot tub. For many of us, our activity is reduced in the winter months. The shorter days and colder temperatures discourage us from spending time outdoors, and our bodies generally experience greater stiffness in the cold. The warm massaging action of your hot tub’s jets stimulates those stiff muscles and joints while you relax and take it easy. You’ll probably feel more energized after your soak as some of that tension melts away and your body feels warmed up and ready for activity. In the winter, our energy levels may decline, the temperature drops, and motivation seems harder to find. As a result, our fitness and activity levels tend to decrease. Using your hot tub can be a great before-and-after ritual for your winter fitness routine. Soaking for twenty minutes before exercise warms up your cold and stiff muscles, joints, and ligaments, making them less prone to injury. A relaxing soak can also help focus and energize your mind, making you feel more mentally prepared for a workout. Good self-care often helps you find motivation. After you take a brisk walk, visit the gym, or perform any other physical activity, your hot tub can once again can help you relax. It can also massage your muscles after they’ve been working hard. A dedicated routine of supporting exercise with your hot tub can help you sustain your fitness goals over the long winter months and give you a reason to look forward to working out. During the winter, we spend more time indoors. Even when we’re outdoors, the sunlight isn’t as strong and direct as it is during the rest of the year. Our brains and bodies respond to this change in natural light with a desire to stay inside and hibernate. Even in cold weather, though, we still need to expose ourselves to some of that life-giving sunlight. When we don’t, our natural withdrawal tendencies make it difficult to feel alert and actively engaged with life. 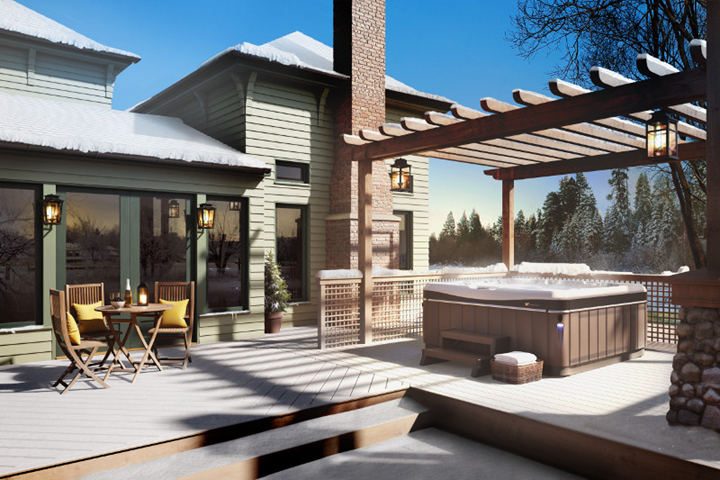 A hot tub provides you with an opportunity to spend time outdoors, even in cold weather, and this can make winter more pleasant and magical. It’s a chance to rest and be comfortable while exposing yourself to fresh air and sunlight, providing you with some much-needed reinvigoration when the days are darkest and shortest. 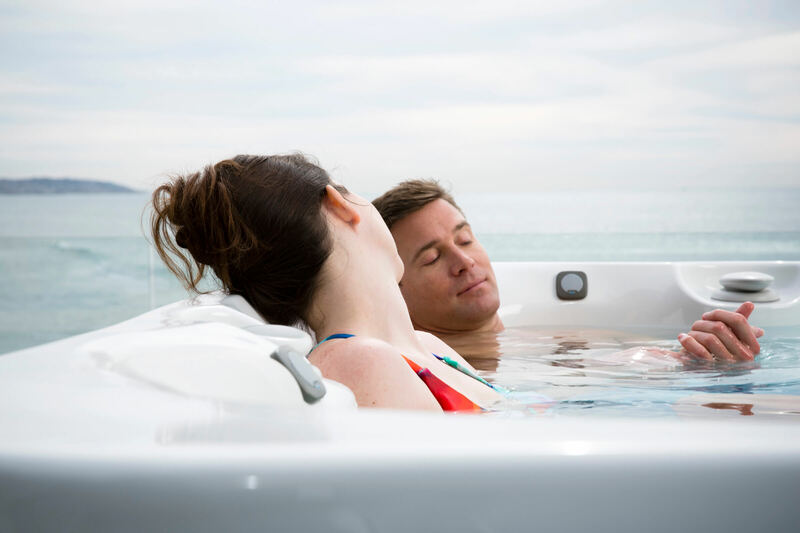 Relaxation and general stress relief are among the many benefits your hot tub offers. Stepping out of the cold air and into warm, softly-bubbling water is enough to wash away your concerns in the moment. You may even plan an occasional home spa day where you fully focus on your practice of renewal. In addition, you’ll find that your hot tub serves as a gathering place for connection among family and friends. By sharing in this winter self-care, you can all support each other and benefit from the warm company. Stress is not unique to the winter, but it can hit us particularly hard during this time. Maybe you’re feeling the strain of a colder than normal winter, or maybe you’ve got lingering cold-weather aches and pains that turn even simple tasks into stressful ordeals. Whatever your circumstances, your hot tub invites you to step into your relief. This method of healing is here for you all year round, so you can keep up your resolutions for a balanced lifestyle and increased well-being. Now is as good a time as any to kick-start your journey with a warming soak. Contact us and let us show you a hot tub to fit your needs, your lifestyle and your budget! Does Your Hot Tub Help You Sleep Better?